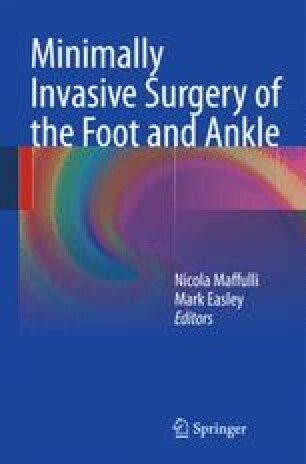 Fusion of the first metatarso-phalangeal (MTP1) joint is a useful procedure in forefoot surgery, and is still considered the gold standard for the management of severe painful hallux rigidus. Normal walking and running are possible after MTP1 fusion, as the interphalangeal (IP) joint develops compensatory hypermobility in dorsi-flexion.1,2 The main difficulty in this procedure is the 3D positioning of the arthrodesis that should be adapted to global foot anatomy, daily activity and shoe wearing habits of each patient.3–7 Another non specific difficulty is linked to the primary stability of the fusion depending on both technique for fusion site preparation and type of internal fixation.6–13 Several open or arthroscopically assisted procedures for MTP1 arthrodesis have been described, with fusion rates from 90% to 100%. The authors present a percutaneous procedure for MTP1 fusion with details on the surgical technique, first results and discussion of the benefits and indications.